The Gobi Desert in northern China and southern Mongolia is one of the largest deserts in the world. Like other deserts, it is a harsh climate, but it is particularly known for its highly variable temperatures, even over the course of a single day. Photographer Adam Gibbs has been photographing in China and recently explored the Gobi in pursuit of interesting patterns and other landscape photography opportunities. In the video below, we join Gibbs. "The thing with sand is a lot like photographing snow in that you really need a bit of light and contrast to give dimension. When there's no light on the sand, it looks very flat. As soon as that sun comes up and you get shadows and highlights, it transforms the landscape," says Gibbs in the video below. 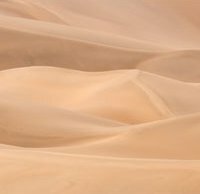 It is tempting to capture an image of the entire scene when out in the desert, as it is quite spectacular and for many of us, something new and unusual. However, Gibbs wanted to fight the urge and focus in on small, intimate details, patterns and textures. To view more of Adam Gibbs' work, visit his website. You can see more behind-the-scenes videos and different photography and photo editing tutorials by visiting his YouTube channel.